Electric Underfloor Heating Installation in Edinburgh, Fife, Glasgow & Scotland with supply services throughout the United Kingdom. Welcome to the Carbon Heat website, we are Scotland's underfloor heating & flooring specialists and one of the UK's leading online suppliers for both radiant electric & warm water underfloor heating. Based in Edinburgh, Scotland we have extensive knowledge and experience working within the heating and flooring industries. We now cover all the major parts of Scotland supplying and installing underfloor heating in Edinburgh, Fife and Glasgow amoungst other areas. Our heating products are maintenance free and designed to suit every space and any situation. Offering both comfort and luxury to any home, office or commercial area. More information about underfloor heating. All our heating products are available to buy online and come with a Free delivery service. Our range includes laminate heating, underfloor tile heating systemsub addition to systems for wood and stone floors, carpet and vinyl. Carbon Heat strive to provide our customers with the highest quality products currently on today's market, including Underfloor Heating Mat Kits, Loose Cable Kits, and Carbon Kits direct from our manufacturer at trade prices. Our system's are compatible with Vinyl, Tiles, Wood or Carpet flooring we are confident that we can provide the right solution to meet your needs. All our prices include VAT so the price you see is the price you pay. All of our electric floor heating systems are backed by a 10 Year Manufacturer Guarantee. Which means if your system was to go faulty within 10 Years of installation we will replace it for you free of charge. This means you can be safe in the knowledge that your investment in underfloor heating is safe and reliable. Our underfloor wood, laminate, tile and stone heating systems are made and designed for both the professional installer or the diy enthusiast and can be used virtually anywhere that requires comfortable indoor heating. This means you can buy a floor heating kit and install it yourself by using the installation instructions that come with every kit. You can also consult our summarised guides on how to install our systems, choose one of the following: How to Install Cables, Cable Kits & Cable Mats or How to Install Carbon Heating Film. Please note: you will require a qualified electrician to make the final connection. If you feel more comfortable with the idea of a professional installing your heating system for you, then we offer a high quality installation service. Read more about the installation service. If you are a professional tradesman who offers service's in homes, offices, public buildings etc then underfloor laminate heating and tile heating is the perfect partner to suit your business. For example if you are a conservatory installer or loft converter, you could add an installation of underfloor heating to your current service this will add more value to your business and help you gain an advantage over your competitor's. Where Can Underfloor Heating Systems Be Installed? Suitable for under tiles, stone and wood and laminate flooring they can be used under carpets or luxury vinyl. We will shortly be launching our real wood engineered flooring and laminate flooring ranges, both ranges are perfectly compatible with electric diy heating. We even have a system designed to specifically fit to your ceiling to give you a more natural warmth throughout your home at low cost and without the need for those unsightly radiators. 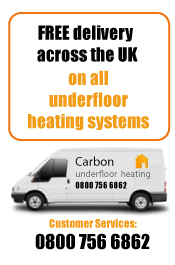 Carbon Heat floor heating products are manufactured here in the UK and Scotland to the highest british standards and are some of the best products currently available on the market for heating in the home. The systems involve a relatively clean installation and are virtually maintenance free, which means you can spend more time enjoying your new radiant home rather than worrying about maintaining the system. Don't delay with obtaining the perfect heating system for your home for any floor type such as laminate or tile floors. You could be sat relaxing in your living room or kitchen in no time with radiant heat rising from your floor. We install floor heating systems throughout Scotland Edinburgh Fife and Glasgow. To complement our systems we also supply a wide range of high quality laminate and wood flooring to make the perfect floor heating solution. The floors are designed to be perfectly compatible with our systems, which means you can now have the perfect flooring solution. Our range includes Bamboo flooring, Cork flooring, Real Wood Engineered flooring and laminate flooring. To view our range of rich and beautiful colours please visit our flooring section. Ceramic & Porcelain Floor Tiles Italian Stile, Carbon Heat work very closely with a UK and Scotland leading manufacturer and supplier of genuine italian Ceramic & Porcelain wall and floor tiles. With arguably some of the finest and most prestigious range of tiles currently for sale within the UK and all produced within there own factories, find a solution the italian way.